After blowing a 13-point lead earlier in the second half, Syracuse closed with 14 of the game’s final 20 points to come back for an 81-74 win over Buffalo at the Carrier Dome. Point guard Frank Howard, who committed two turnovers that allowed the Bulls to go back on top with just over three minutes to play, responded by keying an 8-0 run that gave the Orange (10-1) enough breathing room to hold on for the victory. After turning the ball over on consecutive possessions that allowed the Bulls (7-4) to erase a three-point deficit, Howard drilled a three-pointer to put SU back in front, then added a lay-up and free throw on separate trips for a 75-68 lead with 48.7 seconds to play. That margin allowed the Orange to secure the win, as Oshae Brissett connected on six consecutive free throws to keep Buffalo at bay in the waning seconds. The Bulls proved to be a live opponent, but the SU defense was tough for them to hurt. Buffalo shot 37.7 percent from the field in the game, but only 29.4 percent on 34 attempts from three-point range. In contrast, Syracuse made half of their field goal attempts in the game and 24-of-29 fouls shots in the contest, including 21-of-26 in the second half. A 17-5 run from the Orange early in the game gave the hosts a nine-point lead by the midpoint of the opening half. Six straight points to start the streak gave SU the lead, then Oshae Brissett and Tyus Battle drained three-point shots to keep the Bulls at bay. Brissett then added a three-point-play and Mathew Moyer a putback score for a 19-10 lead with 9:44 left in the first half. 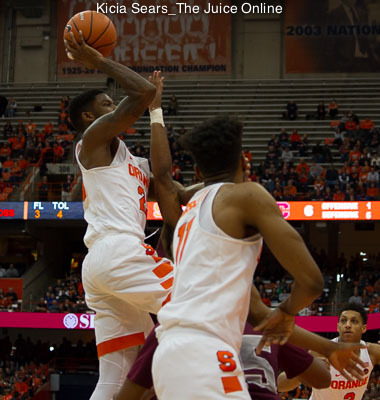 Buffalo remained within arm’s length for the next few minutes, but, paced by Frank Howard, Syracuse hung up seven of ten points for a little breathing room. Howard threw a nifty no-look pass to Moyer for a slam off the right baseline, then slipped a bounce pass to Marek Dolezaj for a lay-in. Not done yet, Howard caught a pass from Battle on the next Orange possession and buried a triple from the right side for a 32-23 lead with just over three-and-a-half minutes left in the opening half. While SU would nudge the lead out to 11 points, the Bulls got a late score to head to the locker room down 36-27. After the Orange got two quick scores out of the locker room, the gap would bounce between 11 and 13 points in the opening minutes of the second half. Buffalo responded to the last of the 13-point gaps with an 18-6 run, capped by five straight points, to draw within 50-49 just over nine minutes into the second half. Battle buried a long jumper from the left side in an attempt to keep the Bulls at bay, but they responded with back-to-back scores to take a 53-52 lead with just under nine minutes on the clock. 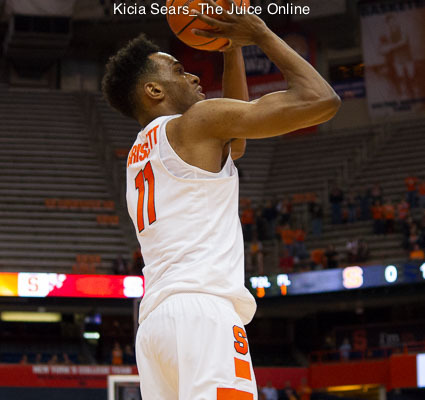 After each team posted a triple, Battle and Brissett each had a pair of foul shots that gave Syracuse a 59-56 lead. After the Bulls again went in front, Howard had two foul shots and Paschal Chukwu one for a 62-60 Orange lead. Following a Buffalo score, Brissett coaxed in a drive while being fouled and nailed the free throw. Marek Dolezaj followed that with a basket inside for a 67-62 SU lead. The Bulls responded with three consecutive scores in the paint for a 68-67 lead with just over three minutes on the clock, the latter two coming off miscues by Howard. The junior guard responded by shaking free from his defender and connecting on a trey that triggered eight unanswered points and gave Syracuse a 70-68 lead. Battle tried to create on the next Orange possession and got a whistle, then made both foul shots. On the next SU trip, Howard hesitated off a screen and cruised in for an easy lay-up and a six-point lead with under two minutes to play. Just under a minute later, Howard capped the burst with the first of two free throws that gave the hosts a 75-68 lead with 48.6 seconds to go. The Bulls responded with a triple, then fouled Brissett in the backcourt. The freshman forward rose to the challenge, burying those two foul shots, then hitting four more in the final 20 seconds to hold off Buffalo and ice the game. Oshae Brissett matched a personal best with 25 points in the game, including a Carrier Dome record with 16 free throws in as many tries. While he had several troubling moments in the game, Frank Howard added 18 points to the SU cause, half coming on three triples. Tyus Battle added 13 points while grabbing four steals and Matthew Moyer fell just shy of a double-double, piling up a dozen points and nine rebounds. Paschal Chukwu was a force inside, blocking eight shots in the game. Nick Perkins paced Buffalo with 18 points off the bench. Wes Clark hit a trio of treys en route to 15 points while C.J. Massinburg hit all nine of his free throws for the bulk of his 14 points. Jeremy Harris and Jayvon Graves each chipped in with eight points. Syracuse will be off until Friday night, when they will entertain another foe from western New York, St. Bonaventure. The Bonnies stand atop the Atlantic 10 with an 8-2 record and will bring a five-game win streak into their home game Wednesday night against Northeastern prior to their matchup with the Orange. Matt Mobley and Jaylen Adams form one of the premier backcourts in the nation for St. Bonaventure, as they each average a shade under 18 points per game. Mobley averages 17.9 points and 2.5 three-pointers per game while Adams, who recently returned from injury, is averaging 17.8 points, 6.5 assists, 2.5 steals, and 2.5 threes per game on 47.6 percent shooting from beyond the arc. Friday night’s game will get underway at 7:00pm Eastern and can be seen online at ESPN3.com.